Man, it's been hot. And while we have the benefit of central AC when we need relief, Violet gets bored indoors pretty quickly (which quickly escalates to her destroying things). I've found that Violet is very sensory-activity oriented and water play is a great activity that allows her to be outside, do a sensory activity, and stay cool. 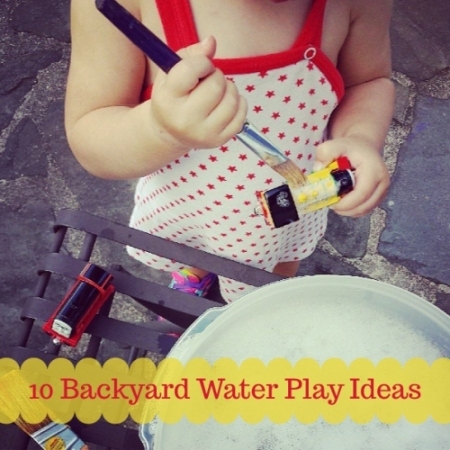 Toss on some sunscreen and enjoy these 10 easy and fun backyard water play ideas. 1. Garden care. Need to water the plants anyway? Teach your kids to use the spray hose; kid fun + knocking off a household chore = win! As you can see from the photo above, 2-year-olds can handle spray hoses! 2. Add a twist to bubbles. On Twitter, @toddlersummer shared, "My kids love squirting bubbles with spray bottles to try to pop them. (And usually end up spraying each other too!)" 3. Classic sprinkler play. When I was a kid we spent a lot of time running through a traditional sprinkler that threw off a ton of water and resulted in a swamp. We have an inexpensive wiggly sprinkler (it's long with maybe a dozen wiggle water "arms") that the girls love. It throws off just the right amount of water -- enough to water the plants and provide cool relief without resulting in a swamp. And the wiggly sprays result in lots of happy squealing. 4. Wash the car. On Twitter, @lifewithroozle shared that her kid loves washing the car. Kids can do this with their ride on toys, or older kids can wash your actual car. Laurel loves this project and it's another kid fun + household chore win. 5. Wash toys. Violet loves washing toys (trains, baby dolls, small plastic toys) and it's a nice low water use activity. I just put water in a large plastic bowl with a few suds, give her a paintbrush, and she's good to go (see below). 6. Water balloons. I always caveat this activity with: you must clean up all the balloon shreds afterwards. If you want to win major fun parent points, opt for this approach: my friend Jim Higley shared an awesome photo showing a big bin of water balloons including a sign that said, "Ryan, These are your water balloons! I am armed with a water gun and will shoot! Catch me if you can! Mom" Awesome. 7. Freeze it up. Via Facebook, Pure Wander shared, "We love finding fun containers to freeze ice in -- making long sticks, swirly shapes, the works. Little ones love playing with them on a hot day!" A big bowl of chipped ice and ice cubes would also make a fun new landscape for little toys. 8. Make water prints. Use feet, sponges, stamps...experiment with making different prints on the patio. 9. Paint with water. Via Twitter, @TGBTS suggested painting with water. Add a little magic with food coloring or make chalk paint by adding cornstarch and food coloring to the water. 10. Wash stuff that actually needs to be washed. Clothes need to be rinsed of sand and mud? Buckets or other household items need a gentle wash with water? Last summer, my mother-in-law cheerfully suggested that Laurel join her in washing down our fences. Turned out to be a super fun project that made our backyard look a lot better too! Do you have other great backyard water play ideas? Feel free to share in the comments below!